Well, Serpent Thing. Remember a few years ago during Fear Itself when the Serpent sent those seven evil Thor hammers crashing into Earth and gave seven superheroes/supervillains crazy Thor powers? Me too. I loved that event. Poor Ben Grimm happened across one of those hammers, touched it, and became a bad guy for a few issues. Plus, the dude — who already is roughly ten times as strong as Spider-Man — now possesses a magic weapon that would crush dear Spidey’s skull into Spidey goo with one well-placed shot. So, it’s going to be a tough fight today for our protagonist in Fear Itself: Spider-Man #3, written by Chris Yost and drawn by Mike McKone. On a list of superheroes Spider-Man couldn’t take in a fight, Thing and Thor are both totally included. 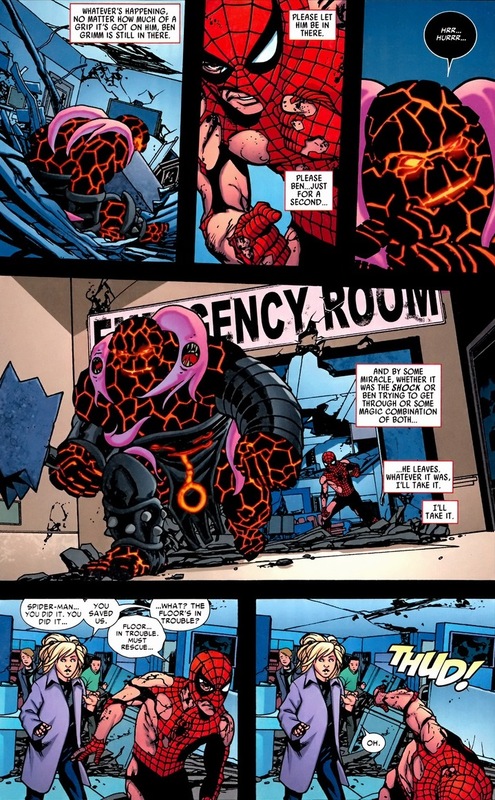 Thus when you have the Thing with Thor powers, poor Peter Parker’s best case scenario ends with him roasting like a kebab draped over the Serpent’s hammer. Y’see, we like to think that our superheroes could defeat any other superhero given the right conditions, weapons, setting, enormous amount of kryptonite, etc., but it’s okay to admit that our favorites may not be all-powerful. The risk of failure adds to the suspense during the brawl and the joy we’ll feel when our superheroes win. 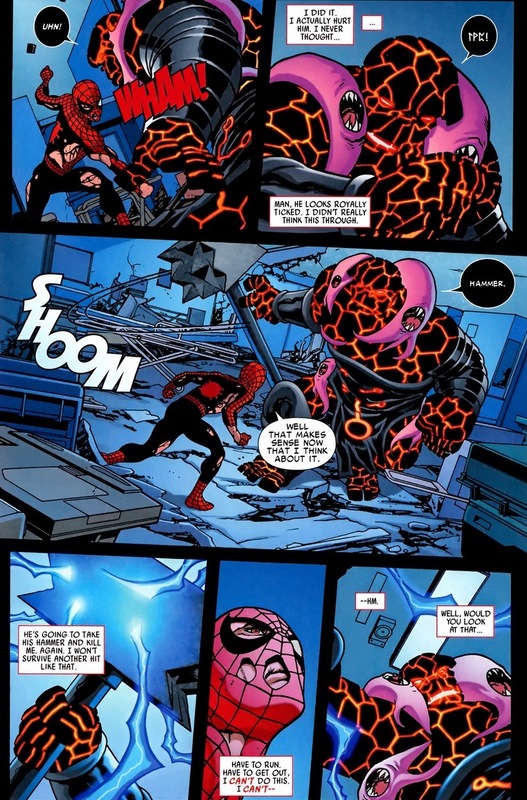 Plus, if you’ve ever read a Spider-Man comic then you know that he never ends a fight without his costume in tatters and half his face swollen like a volleyball. Luckily, Spider-Man has friends. 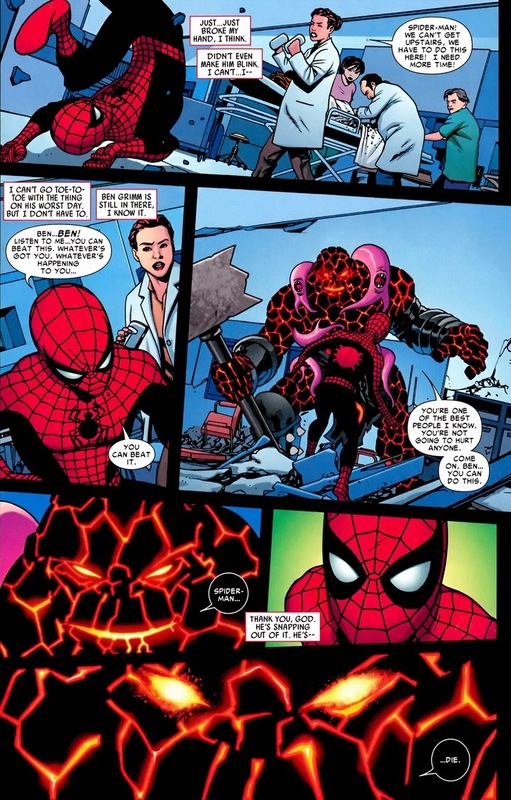 Norah Winters, Spider-Man supporting character and overeager-bordering-on-unlikable reporter, attempts to outrun a rock monster wielding a medieval weapon just to give Spider-Man time to recover (and allow doctors to restart his heart from pages I’m skipping). Her superpowers include all of those given to a normal 20-something year old woman. Unfortunately, fiery spirit and unrelenting bravery can’t protect her from becoming Serpent Thing’s shoulder worm food. Luckily, Norah also has friends. The more I read, I keep finding pages that reiterate why Spider-Man’s my comic soulmate. Yes, he’s powerful, but not that powerful. He’ll fight supervillains way out of his league simply because, gosh darn it, that’s the right thing to do. And no matter how concussed he gets or how badly his costume tears, he’ll continue to jump kick and shoot webs regardless of the insanity or recklessness of the situation. Innocents must be protected over personal safety every single time. Great power, great responsibility, etc. Thing’s exit ties into another Fear Itself moment going on, but I’ll still count this at least as a draw. Hey, this is sort of related, but do you remember Avengers vs. X-Men #9? After weeks and weeks of the two super teams screaming threats, blowing each other up, and destroying large parts of Wakanda, the Avengers were cornered by Phoenix-empowered Colossus and Magik. 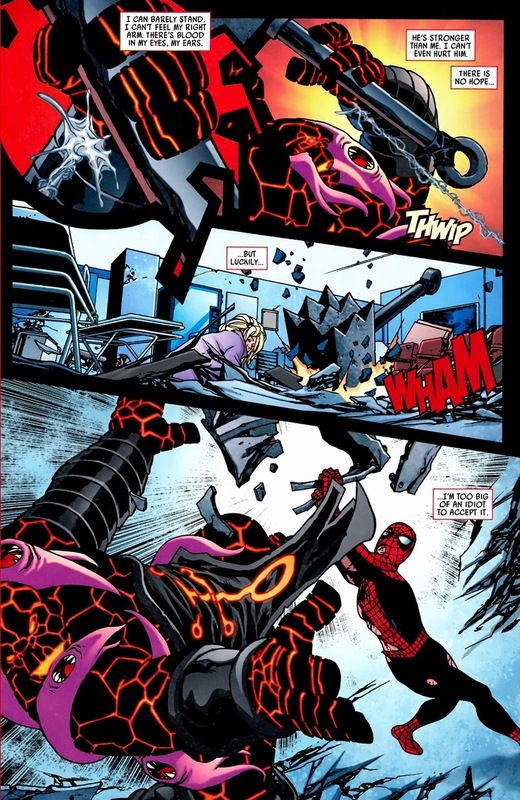 Spider-Man, despite once again not standing a chance against either of these normally — much less Phoenix-enhanced — stayed behind alone to fight while the Avengers made their escape. As Colossus and Magik crushed his brain over and over again, they demanded he stay down. If he acquiesced to their demands, all the brain punching would stop. 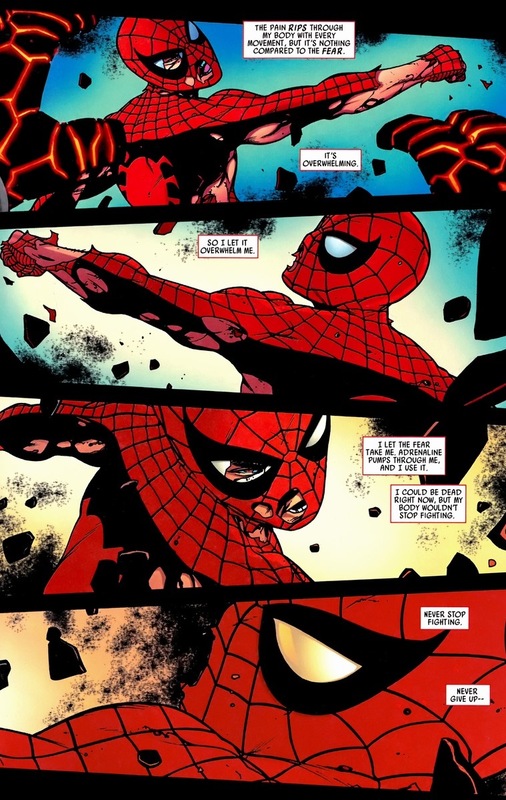 But Spider-Man continued to rise, not just to save his teammates but also because selflessness propels Spider-Man to shine as the center of Marvel’s moral compass. Blogs declared his stand to be what may have been the first heroic act done by anyone in the entire series. And of course it was. God, I love that man. 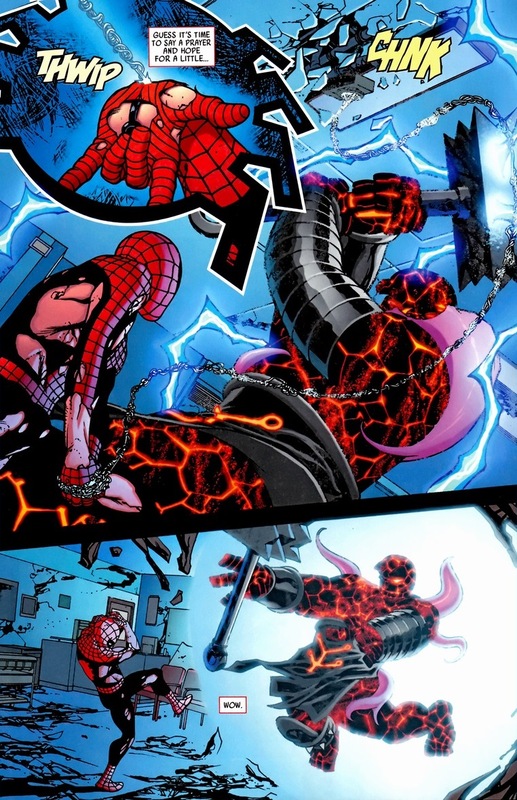 As much as I’ll miss Doctor Octopus Spider-Man (Superior Spider-Man is by far one of the coolest and most beautifully executed ideas I’ve read in a very long time), I’m glad Peter Parker Spider-Man is back. Because he’ll punch Serpent Thing until every bone in his body breaks. Because he’s a superhero. Spider-Man was always my favorite, too… since I was a little kid in my jammies watching Spider-Man and His Amazing Friends and eating bowls of Donkey Kong cereal. Amen… Spider-man would be called “the best of us” in terms of heroism. 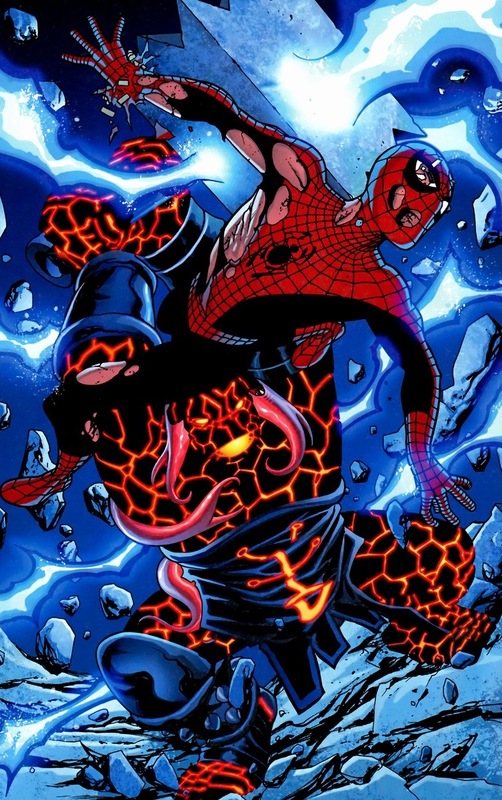 Have to try finish reading the superior spiderman series. I’ve been getting into Octo-Spidey, and I’m kinda sad he’ll be leaving soon. But this is comics, and everyone knew Pete wasn’t going to be out of the suit for long, especially with the new Spider-man film coming up. 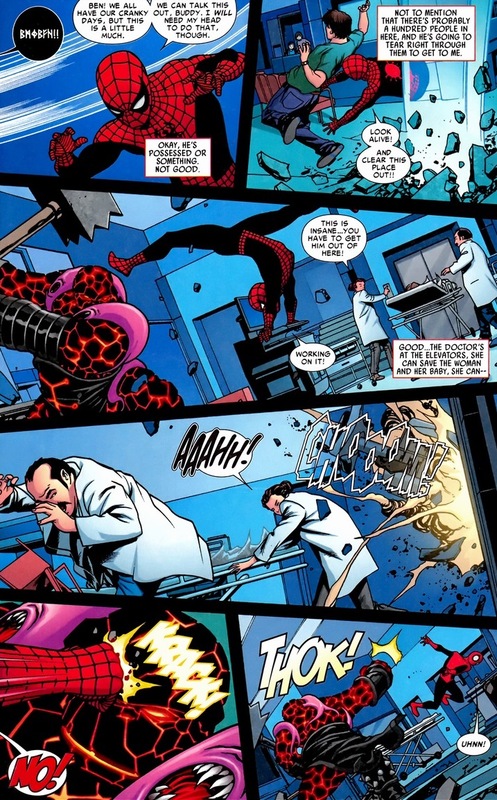 I’ll miss Doc too, but he completely ruined all the trust Spidey built up during things like this. Quick question, I’ve always thought you referred to Cap as the moral center of the Marvel Universe? I have no problem with Spidey as the center, but it’s an interesting discussion. Perhaps I’m wrong and Cap is the undisputed “leader” of the Marvel Universe, but I’d be interested to know. Well to be fair to you, I contradict myself sometimes. I like to think they share the top spot on the moral podium, but I imagine the difference is instead on the consequences/rewards of their unwavering morality. Captain America gains tremendously from it — respect from everyone, unquestioned leadership, a sense of awe when he’s around, etc. — despite him not being the strongest, fastest, or most powerful superhero. Captain America shows up and people know that whatever decision he makes will be the right decision. Period. Because he’s the moral center of the Marvel universe. But for Spider-Man, it’s the opposite. He only loses from his moral decisions. His family and loved ones get put into danger, he has to sacrifice admiration and love from both his peers and the public, his emotional state usually winds up somewhere between frustrated and insecure, etc. That’s all simply because he, like Captain America, has to do the right thing at all times no matter what the consequences or ramifications. Am I close? Maybe that’s why Spider-Man’s Big Time arcs were such a huge hit — he continued to be that paragon-of-justice-no-matter-what, but at least now he also get the money love he so badly deserved. Though I guess now it’s back to zero after the mess Doctor Octopus Spider-Man made (he used the most powerful weapons in comics: the status quo). I grew up on Spidey, and when he is written properly he is a fantastic role model. He never gives up (well, he does, but after finding some inner strength or remembering his motto he comes back), he makes mistakes but always works to set them right, and he’s funny. He’s not perfect, but that somehow makes him better. He doesn’t always win, in fact a villain will often hand him a beating, but he learns from his failures and comes back for another round, showing us that if you keep at it, you can sometimes do the seemingly impossible. Sometimes he forgets just how good he has things in life, blaming the “old Parker Luck” for all the little misfortunes that fall into his life. If he weren’t so focused on how not to get his head caved in by Rhino/Scorpion/what have you, he’d realize that even just being alive is a fantastic stroke of luck. You know, considering he has “radioactive blood”. 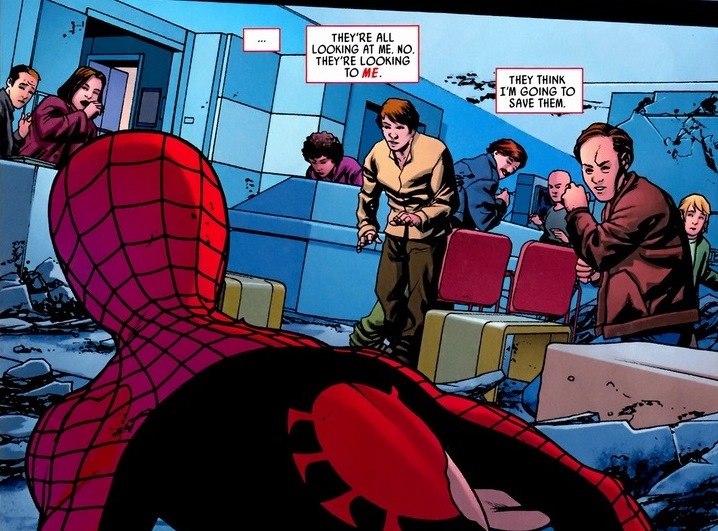 Sadly, these days the “creative” staff seem to forget who Peter Parker/Spider-Man is. We end up with terrible stories or gimmicks that serve nothing other than to boost sales. 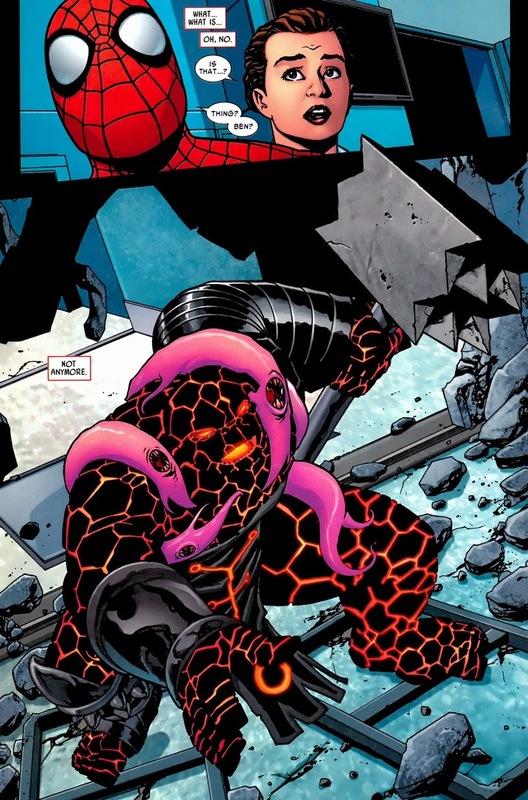 The best versions of Peter in YEARS were in his run in Ultimate Spider-Man, and in the Marvel Adventure series that was aimed at children and younger readers. I bought them for nieces and nephews, read them out of curiosity, then bought them AGAIN to make sure that ALL the young kids in my family had a chance to grow up with a real hero. Having a hero like Peter to look up to is something that any child could benefit from. The example you gave in this article is a perfect example of why.